W. Ray Johnston, owned Rayart Pictures Corp., Raytone Films, Continental Talking Pictures and Syndicate Film Exchange. Trem Carr, who owned Sterling Pictures and Trem Carr Productions Ltd. bought stock in Johnston's Syndicate Film Exchange and distributed his films through Syndicate. In 1931, they merged and reorganized Syndicate to form Monogram Pictures, with Johnston as president and Carr in charge of production. Paul Malvern, who assisted and learned the business from Trem Carr, formed his own production company called Lone Star Productions that also had Monogram as distributor. Robert Bradbury scripted almost all of Monogram's and Lone Star's early western movies and his son 'Bob Steele' their primary star. Bob Steele also helped his high school buddy, Marion Morrison, get a job at the studio as stock boy. Marion learned rapidly and would soon change his name to John Wayne and become their biggest star. 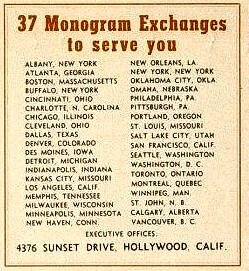 On the right is Monogram Exchanges and their locations in 1933. Monogram had all of it's film production processed at a local film processing company called Consolidated Film Laboratories owned by Herbert J. Yates. Having growing pains, Monogram started running up large amounts of processing debts to Yates. Yates, 10 years their senior, saw an opportunity to expand and masterminded a merger. The merger consisted of Yates' Consolidated Film with Carr and Johnston's Monogram, Paul Malvern's Lone Star, Nat Levine's Mascot Pictures and M.H. Hoffman's Liberty Films — to create a new enterprise called Republic Pictures Corp.
Republic officially started in 1935 with their first film Westward Ho staring John Wayne. But soon, conflicts arose in 1936 between Johnston and Yates to the point that Johnston pulled out with Trem Carr and Paul Malvern leaving with him. Carr produced some films for Universal while Johnston reorganized Monogram. To raise money, some of the earlier films were rereleased through Astor Pictures around 1937-38, and then some through the new reorganized Monogram. In 1939, after raising money, he looked at branching into other genre as well. He signed Boris Karloff to do 6 films and an aging Bela Lugosi from 1941 to 1944 to do what was later called the Monogram 9. On the left is the list of Monogram Exchanges in 1941. In 1943, they expanded with new studios and added such great features as Charlie Chan and the Bowery Boys. They didn't turn their back on westerns, they signed Johnny Mack Brown, when the major studios decided to move away from westerns. During this time Monogram maintained an average of 40-50 feature films per year. Trem Carr died in 1946. After Carr's death Johnston step down and President to become Chairman of the Board and Steve Broidy (the Sales Manager) took over at Monogram. That year Broidy formed Allied Artists to handle the better grade films. 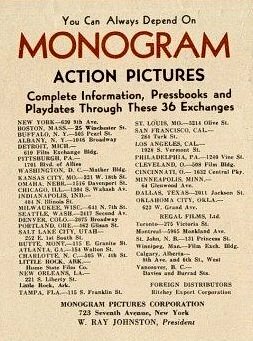 Allied Artists was a wholly owned subsidiary of Monogram but Allied was treated as a separate entity except for using the Monogram distribution exchanges. In August 1949, Stratford Pictures Corp. was organized to import international films and distribute them through the Monogram Exchanges. Stratford had Steve Broidy as president and George D. Burrows as vice president. In 1951, Broidy organized the Interstate Television Corp. for the purpose of producing television films. 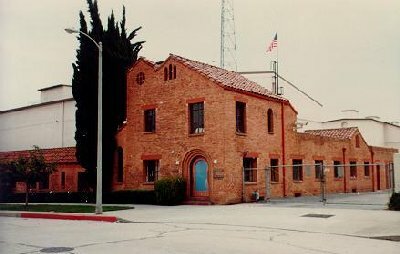 The name was later changed to Allied Artists Television Corp. In 1952, Broidy stopped producing the low budget films that Monogram was famous for and on November 12, 1953, the name was officially changed to Allied Artists Pictures Corp. In 1964 Allied stopped production and moved their headquarters to New York and reorganized. Their offices were located at 230 W. 41st St. in New York. On Feb. 12, 1965, Broidy stepped down and Claude A. Giroux was elected president and CEO with Roger W. Hurlock as vice president and COO. In 1967, Hurlock became president and Emmanuel L. Wolf became Chairman of the Board. By 1968 production had resumed after a 4 year dormancy. Allied primarily became a film distributor importing international films and distributing them domestically. Allied had offices in Argentina, Australia, Brazil, Chile, Indonesia, Japan, Mexico, Pakistan, Panama, Philippines, Puerto Rico, Uruguay and Venezuela. Allied had a brief revival of production to make Cabaret (1972), Papillion (1973), and Man Who Would Be King (1975). Shortly afterwards, Allied filed for bancruptcy. C. S. Lamb, a movie producer, has bought up the logos and rights to Monogram, PRC, AIP and several other b-movie studios and has started reviving them. They plan to re-release some of the old GEMS as well as produce new b-movies... For more information you can go their website. We applaud Mr. Lamb and hope he succeeds.